...Our story opens at the Purple Polka Dot Bees quilting retreat, where Peggy and Petunia are creating blocks for their challenge quilts . 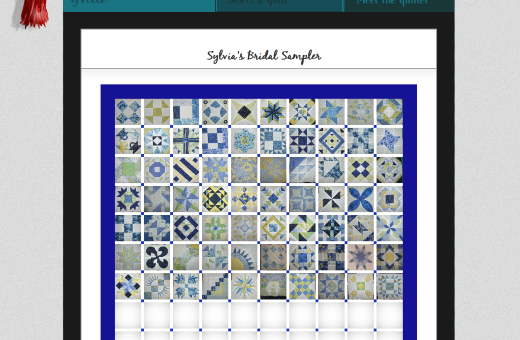 . .
“My sister in Australia wanted to see my progress on my Sylvia’s Sampler quilt, so I arranged all thirty-three blocks on the floor and took a picture to post on my blog tomorrow,” Peggy said, while employing her seam ripper to fix a mistake. Petunia looked furtively at the box of chocolate cookies strategically placed between them, wondering if she had already ingested some cat fur. The two friends left their machines and approached Pamela, who was a newer member of the guild. As the two friends looked on, Pamela made a few “mouse” clicks and was looking at this page . . .
Pamela clicked again, and opened up her personal blog. “Look here, on the sidebar. See that badge? “Charlie is my dog, and this time of year he sheds a lot!” Pamela laughed. 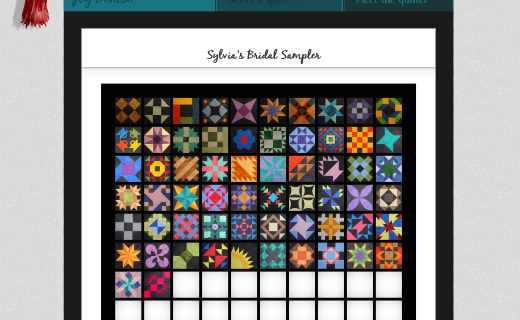 It is a great advantage to be able to observe the flow of colors and the effects of patterns as you design/construct a quilt. 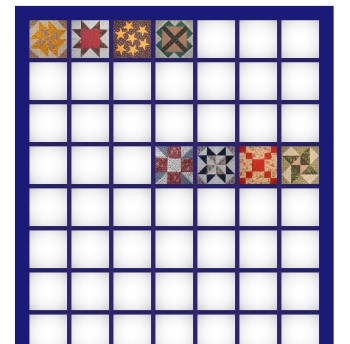 Often you can make adjustments that improve the overall design and feel of the quilt, before it is all stitched together. 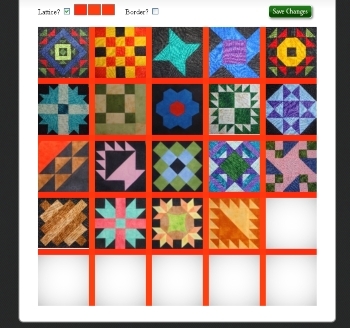 Ole Frog Eyes allows you to easily audition block placement, lattice colors, and border colors, with a few clicks of your mouse! No grommets, no hooks, no holes in the walls, no kittens scampering off with blocks, and no need to use a roller to remove pet hair! 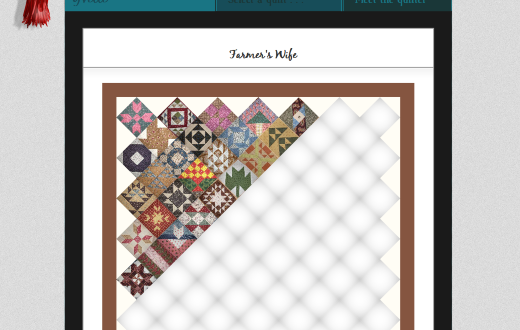 Let’s face it – quilters are becoming more internet and computer savvy every day; after all, you’re reading this blog, right? And I bet you have a camera, and perhaps you blog, yourself! 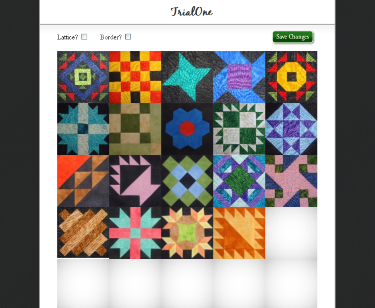 Are you working on the same quilt as a guild buddy, or one of your online quilting friends? Demonstrate your progress by adding your blocks to your quilt in your very own gallery – watch as your friend uploads blocks in another gallery in the same site! There are two quilters who are currently utilizing Ole Frog Eyes to the hilt: Joy Denise and Yvette. And here is Yvette's Sylvia . . . Isn't it fun, seeing the differences in the fabric choices they have made? If they want to, they can change their lattice and border colors and determine if they really made the “right” choice for their masterpieces! I hope you have enjoyed this look at our virtual design wall site, Ole Frog Eyes. I hope that we have inspired you to consider using this site. Cruise around the gallery (Karen, PalmettoQuilter, Joy Denise and Yvette have blocks uploaded), and imagine how easily your friends could see your quilting progress! It really is reasonably priced at less than three dollars a month, so it won’t break your fabric budget! The next day, Peggy telephoned Petunia. "Quick!" she sputtered. "Go to Ole Frog Eyes and look at the gallery! 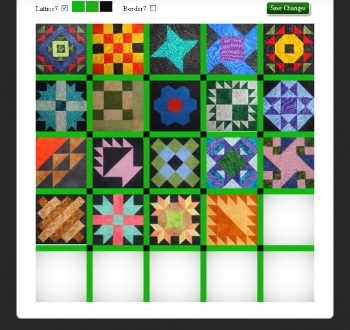 Click on my name, and look at my quilt in progress!" 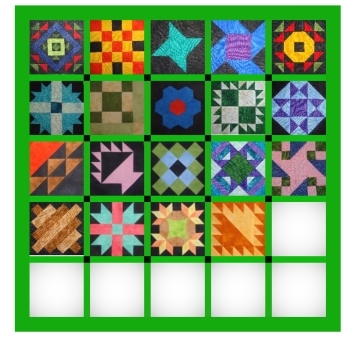 You may recall that on Ole Frog Eyes, members can create up to six quilts at a time, and upload photos of their blocks to actually "build" their quilt in cyberspace. 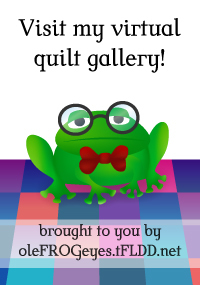 Their quilting buddies can follow and admire their progress by simply opening their portion of the gallery. Petunia hurriedly clicked a few buttons and found herself looking at Peggy's quilt in progress. "What is the matter with this?" she asked. "It looks wonderful." Peggy replied, "Thank you, but I just wanted you to see what we can do with this design wall software. Look at these examples I have posted in my gallery." 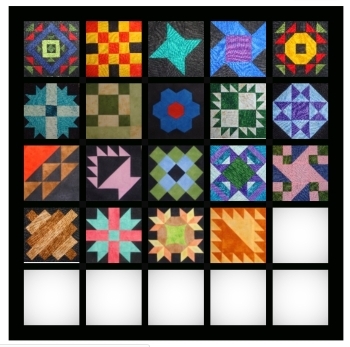 "This is what my blocks look like, with no lattice or border," Peggy continued. "Now look at the next trial version." "That really makes the blocks stand out nicely," said Petunia. "But I'm not so sure about that orangey-red color for the lattice!" "Me neither," responded Peggy. "Try the third one!" "Isn't this the MOST fun?" giggled Peggy. "Instead of crawling around on the floor and trying to put pieces of fabric between my blocks, I just click on the color palette and choose the value that I want - dark or light. Then I can even make the intersections of the lattice a different color, to see if I like it!" "I love that one!" Petunia crowed. Chuckling, Peggy agreed. "The black really focuses the attention on my favorite batiks from my trip to Asia," she said. "I think this is what I'll stick with." See how there is a lot of pink and purple concentrated in one corner of her quilt? Ole Frog Eyes can show you problematic areas and let you re-arrange them, before you sew your rows together, and then have to use your seam ripper! 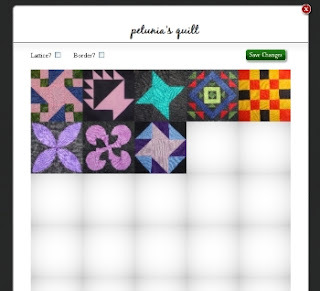 We'd like to thank one of the quilters in our Ole Frog Eyes community, who graciously loaned us the photos from her beautiful Sylvia's Sampler quilt to use in our Stash Manicure post - Joy Denise has six quilts posted on the design wall site, and they are all lovely. In fact, one of her quilts is the last tip we want to leave you.....she wanted to make a Civil War quilt that others had started some weeks earlier in a quilt along. She discovered that the group was on block # 25, so the first week she sewed block #25, and went back to sew block #1 as well. The following week she completed block #26 and block #2. Aww, this may be confusing - let's just look at her quilt! See how she is going to catch up? And Ole Frog Eyes makes it possible for her to see her progress, audition colors for lattice and borders, and even ensure that she doesn't crowd one area with the same color!